We love Wink’s smarthome hub and have recommended it highly in the past. But the Wink Hub has been “temporarily unavailable” in stores for over five months now, and Wink won’t say why. What’s going on? Is Wink done for? Wink has been around for years now and was formerly the product of a company named Quirky. Quirky began life as a startup company in 2009 with several, well, quirky but useful sounding ideas. They announced a mirror that eliminates shower steam fog, a set of wheels designed to turn any object into a remote-controlled car, and more. In 2014, Quirky partnered with GE to create a new company named Wink to focus on internet-connected devices. Unfortunately, Quirky itself didn’t do well; it spent a lot on development with little return, and then Wink suffered a significant setback. Every Wink owner came home to find a hub “so secure that it is unable to connect to the Wink servers” (those were Wink’s words). The problem centered on an expired certificate, and unfortunately, solving it required a recall of many hubs. Between the cost of the recall and other financial difficulties, Quirky went bankrupt in 2015 and the Wink assets sold to Flextronics (now called Flex), which had been the leading supplier for Wink’s hardware and firmware. Flextronics, in turn, sold Wink to i.am+ in mid-2017, where the company remains to this day. If you’re not familiar with i.am+, it’s a company owned by will.i.am, with a focus on wearable technology. Quirky did come back to life but remains separate from Wink. Smarthome hubs live and die by their product integrations. If a smarthome hub doesn’t work with as many smart devices as possible, then users will abandon it for a competitor that does support their gadgets. So it’s disconcerting that Wink last announced new product integrations in September 2017. In any tech industry, let alone the smarthome sector, that’s an enormous amount of time without iteration. To illustrate that fact, the very next announcement from Wink was support for Cortana, complete with pictures of Windows Phones and mentions of the Harmon Invoke Cortana speaker. In the last four months, all of Wink’s blog post updates described firmware updates designed to fix issues. The last new feature, which realistically is an enhancement of Lookout, came over a year ago. But worse than lack of updates and features, it’s almost impossible to buy a Wink Hub now. Wink’s online store has been entirely out of stock since at least November 2018, which isn’t a good sign. Any attempt to add a Wink product to the cart at its website led to “temporarily unavailable” errors. This is true for many of the third-party products on the Wink website as well, like lightbulbs and smart plugs. Even Amazon.com and Home Depot had little, if any, Wink products available. I apologize for the trouble! We are currently restocking our website, which should be up soon. The Wink Hub 2 may be available at our other partnered retailers. I would recommend checking the Home Depot website and selecting “Check Nearby Stores” and putting your zip code to see how many Wink Hubs Home Depot has in stock. Unfortunately, we currently do not have anything specific in the works. As for our stock, you read correctly but we are also working on our inventory as well. So hopefully very soon our retailers, as well as our website, are fully stocked soon. Five months later, Wink hasn’t restocked any stores—either it’s own online stores or retailers. You can find Reddit thread after Reddit thread after Reddit thread of other Wink users asking similar questions, wondering why Wink Hubs were unavailable everywhere and if Wink is dead. 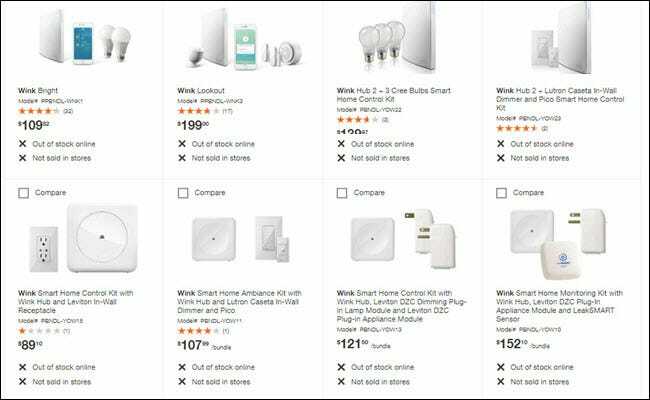 Wink has often told users to check nearby Home Depot stores using a zip code search, but as of today Home Depot’s site states Wink is out of stock online and not sold in stores. Home Depot doesn’t have a single listing for just the Hub either. Amazon is in a similar state; it no longer directly stocks the Hub. Instead, you’ll find it at times offered through a third party seller, often with a future ship date and a price twice as high as Wink’s website. According to CamelCamelCamel, a website that tracks prices and inventory on Amazon.com, the last time Amazon (and not a third-party) had any Wink Hub 2 stock was August 2018. Wink has recommended trying to purchase its product from Walmart in the past, but that store is out of stock, too. 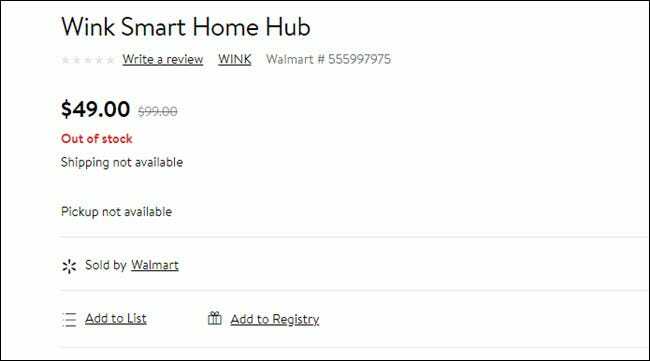 Walmart’s website even seems confused, as it shows the pricing for the original Wink Hub, but the pictures confirm this is a Wink Hub 2 listing. Wink hardware simply doesn’t look like it’s for sale right now, and the company wouldn’t tell us where we could buy it. Wink isn’t looking too healthy, and that’s worrying. The company doesn’t offer any monthly subscription for the service its hubs depend on. Instead, Wink generates revenue through hardware sales. Wink offers a Hub, a motion sensor, a door/window sensor, and a chime, all of which are currently out of stock. You can buy most those items from companies other than Wink, so even if you buy a Wink Hub that doesn’t guarantee you will purchase a Wink sensor. The biggest question is if a company is dependent on hardware sales for revenue and that hardware does not exist, then what future can that company have? Looking around at i.am+ for any direction doesn’t boost confidence. The company rarely mentions Wink, and its latest push is a new voice assistant named Omega. We reached to both Wink and i.am+ for comment on this story. Neither had responded at the time of publication. We’ll update this article if we do hear back. But, given that it’s incredibly difficult if not impossible to buy Wink hardware right now, we can no longer recommend Wink to our readers. It’s hard to see how the company can last in its current state, and remember Wink Hub is a cloud-driven system. Should the company cease operations and shut down its servers, then your smarthome will break, and there’s nothing you can do about it besides move on to a new Hub. Sure, you may be able to find a Wink Hub on eBay or another marketplace. But we don’t recommend it because it will stop working if Wink goes out of business, and the company doesn’t look too healthy to us. If you are looking for an easy to use, simple to setup smarthome hub, we’d suggest SmartThings. SmartThings is slightly more complicated than Wink to use and setup, but it offers a home monitoring kit, third-party device support, and even routines. SmartThings is owned by Samsung, so you can take some comfort in knowing your Smarthome isn’t dependent on a small company that may disappear. But much like Wink, the ease of use comes at some cost to advanced capabilities. If you’re technically savvy and want advanced automations, then you may want to consider Hubitat. Hubitat is capable of automations that can potentially cut out the need for a voice assistant. Instead of telling your home what to do, a Hubitat home can anticipate your needs based on actions, or presence, or other signal factors. Instead of asking for lights, the lights will know you are in the room and turn on, and even turn themselves off when you leave. However, all this power comes with complexity; it is more difficult to set up a Hubitat system than a SmartThings system. If you haven’t started creating your smarthome yet, it’s possible that you can skip the smarthome hub. Google Home and Amazon Alexa are doing an excellent job of negating the need for one. While they aren’t compatible with Z-Wave devices, Amazon supports ZigBee with its Echo Plus and Echo Show. And you can sidestep Z-Wave and ZigBee and go with Wi-FI based devices instead. These will work directly with your voice assistant, allowing it to act as your hub. You’ll still have access to routines and an app that controls your connected devices, but those routine options may not be as powerful as what SmartThings or Hubitat can provide without using another service like IFTTT or Yonomi.